Neonatal tumors represent 2% of childhood malignancies of which teratoma and neuroblastoma are the common types. Neuroblastoma is the commonest extracerebral solid tumor of childhood. It is an embryonal tumor of the autonomic nervous system arising from neural crest tissue. About 70% of the neuroblastomas occur in the retroperitoneum and majority of these involve the adrenal gland. The other sites mentioned are intrathoracic, neck, and pelvis. Pelvic neuroblastoma is a rare location, the incidence being 3.4%. Malignant lesions presenting in the sacrococcygeal region are most often SCT. We encountered a case of primary congenital SCN in a 9-month-old baby girl which was surgically excised. The immunohistochemical markers studied, confirmed the histopathological diagnosis, and the cell proliferative index markers indicated it to be a very low grade lesion, which has prompted us to report this case along with review of literature. A 9-month-old baby girl brought to pediatric surgery outpatient department, presented with swelling in the sacral region since birth. The swelling was initially small and later increased to present size. Local examination showed round and globular swelling measuring 6 × 5 cm. Overlying skin was unremarkable. Systemic examination findings were noncontributory. The female child was born full term by uneventful normal vaginal delivery. She achieved normal milestones for age and was immunized appropriately for age. Laboratory investigations such as liver function tests, renal function tests, plasma glucose levels, and chest X-ray were normal. 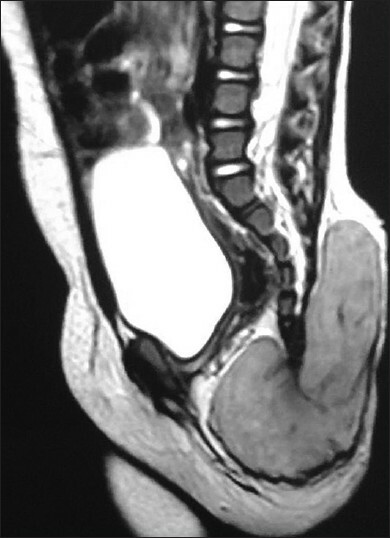 Magnetic resonance imaging findings of the sacrococcygeal mass: T2W sagittal images showed a well-defined lobulated lesion in the pre and retro sacrococcygeal region, encasing the coccyx. The lesion was isointense to hyperintense in signal intensity and showed fine internal septations within [Figure 1]. On the basis of clinical and radiological findings, a provisional diagnosis of solid variant of sacrococcygeal teratoma (SCT) was made. Caudal and general anesthesia was given and the swelling was entirely excised with the part of the coccyx. Postoperative course was uneventful. On gross examination, the tumor was well-circumscribed having smooth and lobulated external surface, firm in consistency, and measured 6 × 6× 5 cm. On cut section, the tumor appeared nodular, greyish white with focal hemorrhagic areas in the periphery [Figure 2]. On microscopic examination, a well-circumscribed tumor composed of round to oval cells with prominent nucleoli and scanty to moderate cytoplasm. The cells were seen arranged predominantly in nests. Also seen were few sheets and lobules, separated by thick and thin fibrovascular septae. Many areas showed presence of Homer Wright pseudorosettes [Figure 3]. At few places, the tumor showed neuropil and schwannian stroma. Amid this, were noted large cells differentiating into ganglion cells [[Figure 3] inset]. There was paucity of abnormal mitotic figures and karyorrhectic activity. On the basis of these findings, diagnosis of neuroblastoma in the sacrococcygeal region was considered and representative sections were subjected to immunohistochemical studies. 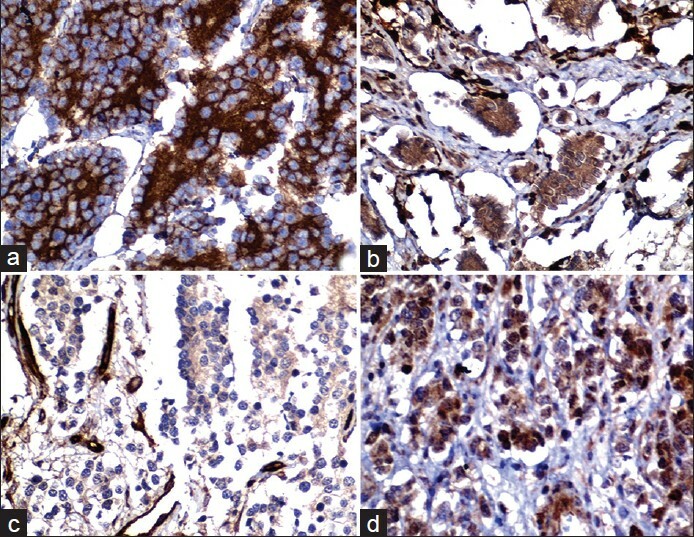 Immunohistochemistry (IHC) was performed with the following panel of antibodies utilized for differential diagnosis of small round cell childhood tumors which included neuroendocrine markers like neuronspecific enolase (NSE) (Dako) chromogranin-A (clone 5H7, Leica) and synaptophysin (clone 27G12, Leica). Other markers included were S-100 (Leica), CD99 (clone 12E7, Dako), leucocyte common antigen (LCA) (clone, 2B11 + PD 7126), pancytokeratin (PanCK) (clone AE1/AE3, Dako), epidermal growth factor receptor (EGFR) (clone EGFR.25, Leica), cyclin D1 (clone P2D11F11, Leica), P53 (cloneDO-7, dako) and Ki-67 (clone MIB-1, Dako). Strong cytoplasmic immunoreactivity was observed with NSE [Figure 4]a, synaptophysin and it was patchy with chromogranin [Figure 4]b. S-100 showed positive cytoplasmic immunoreactivity. CD99 [Figure 4]c, LCA, PanCK, and EGFR were nonreactive. Cyclin D1 showed strong nuclear immunoreactivity [Figure 4]d. P53 was negative and Ki67 labelling index was less than 1%. The above histomorphological studies confirmed the diagnosis of low grade primary sacrococcygeal neuroblastoma (SCN). The neuroblastoma was first described by Virchow in 1864. This term was coined by James Hommer Wright in 1910, who first stated that this tumor arises from the incompletely committed precursor cells derived from the neural crest ectodermal tissue. Neuroblastoma can arise at many anatomic sites harbouring sympathetic tissue and commonly arises from adrenal glands. The other peripheral sites are the neck, thorax, and pelvis. These extraadrenal neuroblastomas generally tend to have better prognosis due to their well-differentiated nature. ,, The pelvic neuroblastomas are rare, the incidence being 5% and constitute 0.25% of all neonatal neoplasms. Among the pelvic neuroblastomas, precoccygeal tumors as encountered in the present case, have not been documented to the best of our knowledge. Few cases of SCNs are reported in literature. 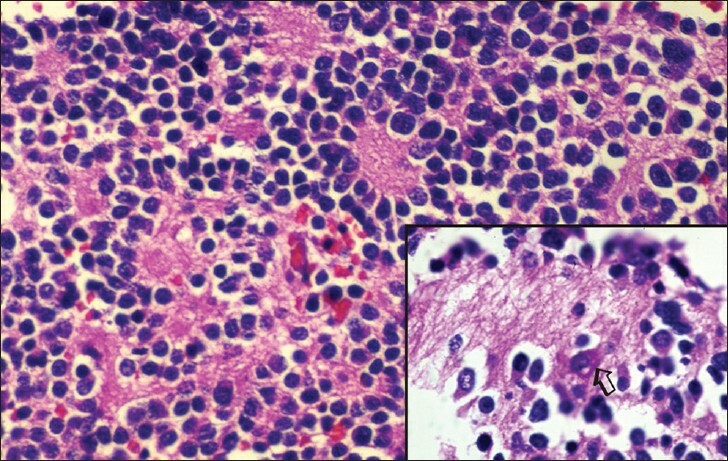 Tanaka et al.,  mentioned first case of neonatal neuroblastoma mimicking Altman type III SCT in 2005. Similar case of a 2-month-old baby girl with large presacral neuroblastoma was reported subsequently. It is worth noting that the present case clinically and radiologically was thought to be solid variant of teratoma. Rarity of SCN was highlighted by Sebire et al.,  who reported one case of SCN among 85 cases of sacrococcygeal neoplastic lesions with an incidence of 1.2%. In literature, one of the large series of localized pelvic neuroblastomas has reported high incidence of neurological symptoms at diagnosis. Our patient was symptom free except for the swelling in the sacrococcygeal region. 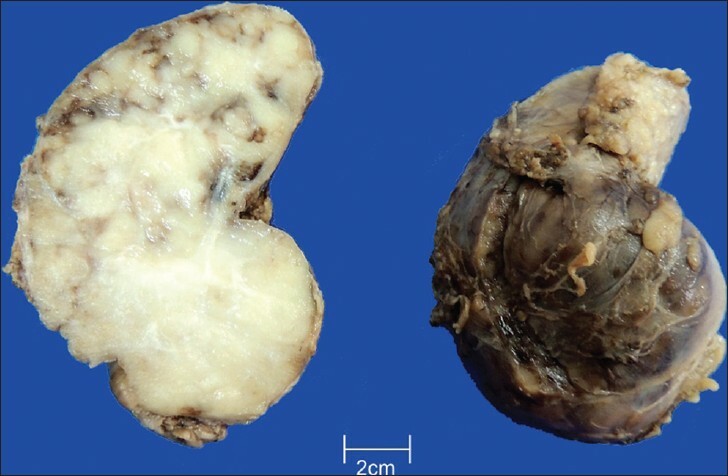 At times, the tumor may be dumbbell shaped and deemed unresectable. However in our case, the tumor was kidney-shaped and was excised completely. Cell proliferative markers such as P53 and Ki 67 are of prognostic significance. In the present case P53 was negative and Ki67 showed less than 1% labeling index. EGFR expression was observed in two tissues by IHC and 8 of 10 cell lines by Western blotting. It is worth noting that our case showed no EGFR expression on IHC. Genomic aberrations of cyclin D1 in neuroblastoma indicating dysregulation of the G (1) entry checkpoint is an important cell cycle aberration in this pediatric tumor. Immunohistochemical analysis done by them showed overexpression of cyclin D1 in neuroblasts. They conclude that neuroblastoma functionally depends on overexpression of G (1)-regulating genes to maintain their undifferentiated phenotype. Our case also showed similar overexpression. SCN though has low mortality, has high morbidity owing to tumor bulk pressure, and probable postoperative neurologic deficit. Patient's age is considered to the best prognostic factor while other factors such as tumor site, stage, histopathology, IHC, tumor lymphoid cell infiltration, urinary catecholamine secretion, serum NSE and ferritin, deoxyribonucleic acid ploidy and N-mync amplification are also considered significant. In our case, the child was less than 1 year, tumor was completely resectable and microscopically differentiated type,  with favorable IHC prognostic markers. Hence, case was considered to have favorable prognosis and thus was informed to the parents and the child was discharged. On 6 months follow-up, the child is disease free and has achieved milestones for age. Our experience with present case highlights the significance of detailed immunohistochemical analysis in each and every case of childhood neuroblastomas. It is hoped that more case studies will elucidate the point further. 1. Moore SW, Satge D, Sasco AJ, Zimmermann A, Plaschkes J. The epidemiology of neonatal tumors. Report of an international working group. Pediatr Surg Int 2003;19:509-19. 2. Ghazali S. Pelvic neuroblastoma: A better prognosis. Ann Surg 1974;179:115-8. 3. Maris JM. Recent advances in neuroblastoma. N Engl J Med 2010;362:2202-11. 4. Rosai J. Adrenal gland and other paraganglia. In: Rosai J, editor. Rosai and Ackerman′s Surgical Pathology. 9 th ed. Edinburgh: Mosby; 2004. p. 1115-62. 5. Rosen EM, Cassidy JR, Frantz CN, Kretschmar C, Levey R, Sallan SE, et al. Neuroblastoma: The Joint Center for Radiation Therapy/Dana-Farber Cancer Institute/Children′s Hospital experience. J Clin Oncol 1984;2:719-32. 6. Sebire NJ, Fowler D, Ramsay AD. Sacrococcygeal tumors in infancy and childhood; a retrospective histopathological review of 85 cases. Fetal Pediatr Pathol 2004;23:295-303. 7. Rothenberg AB, Berdon WE, D′Angio GJ, Yamashiro DJ, Cowles RA. Neuroblastoma remembering the three physicians who described it a century ago: James Hommer Wright, William Pepper, and Robert Hutchison. Pediatr Radiol 2009;39:155-60. 8. Leclair MD, Hartmann O, Heloury Y, Fourcade L, Laprie A, Mechinaud F, et al. Localized pelvic neuroblastoma: Excellent survival and low morbidity with tailored therapy-The 10-year experience of the French Society of Pediatric Oncology. J Clin Oncol 2004;22:1689-95. 9. Sunaa F, Bozkurterb T, Ellic M, Tanderb B, Daðdemirc A, Ceyhand M. A case of sacrococcygeal neuroblastoma. J Exp Clin Med 2013;30:75-7. 10. Hawkes CP, Betts DR, O′Brien J, O′Sullivan MJ, Capra M. Congenital sacrococcygeal PNET and chemotherapy. Indian J Med Paediatr Oncol 2012;33:182-4. 11. Delellis RA, Mangray S. The adrenal glands. In: Mills SE, editor. Sternberg′s Diagnostic Surgical Pathology. 5 th ed. Philadelphia: Lippincott Williams and Wilkins; 2004. p. 545-86. 12. Tamura S, Hosoi H, Kuwahara Y, Kikuchi K, Otabe O, Izumi M, et al. Induction of apoptosis by an inhibitor of EGFR in neuroblastoma cells. Biochem Biophys Res Commun 2007;358:226-32. 13. Molenaar JJ, Ebus ME, Koster J, van Sluis P, van Noesel CJ, Versteeg R, et al. Cyclin D1 and CDK4 activity contribute to the undifferentiated phenotype in neuroblastoma. Cancer Res 2008;68:2599-609. 14. Oppedal BR, Storm-Mathisen I, Lie SO, Brandtzaeg P. Prognostic factors in neuroblastoma- clinical, histopathologic and immunohistochemical features and DNA ploidy in relation to prognosis. Cancer 1988;62:772-80. 15. Shimada H, Ambros IM, Dehner LP, Hata J, Joshi VV, Roald B, et al. The International Neuroblastoma Pathology Classification (the Shimada System). Cancer 1999;86:364-72.